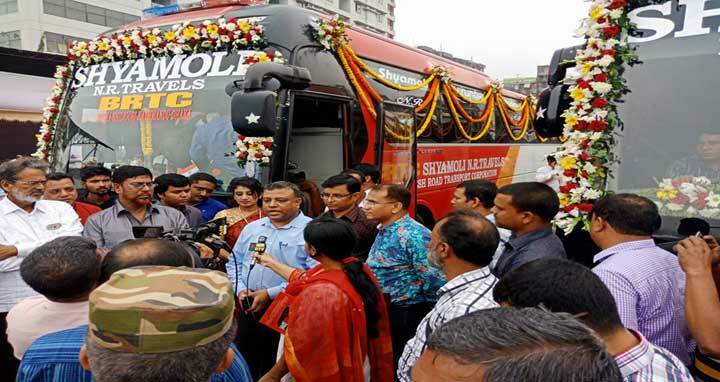 Dhaka, 23 April, Abnews: A bus service on Bangladesh-India-Nepal route on trial basis has been flagged off. Two Shyamoli NR Travels buses, under the supervision of the BTRC, left the Kamlapur BRTC International Bus Terminal at 9am on Monday. Two buses carrying 25 Bangladeshis, 12 Indian and six Nepal representative led by Bangladesh Road Transport Corporation(BRTC) Chairman Fariduddin. The delegation is expected to Kathmandu, Nepal, on April 26, via Shiliguri. They will submit a report based on the journey and a protocol will be signed later on. During the journey, the bus will stop at Rangpur overnight on Monday. The overnight stop on Tuesday night will be at Nepal’s Kakarvitta. The delegation will attend a tri-nation meeting in Kathmandu on April 27.